Something is rotten in the state of Denmark. It’s the cheese. And yet the rot is what makes the stuff so good. 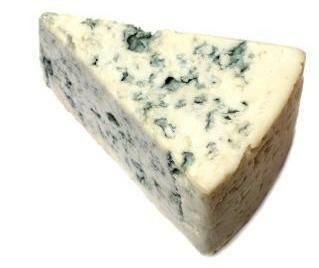 I’m talking specifically about Danish Blue Cheese, one of the ingredients in this week’s soup. FYI: The cheese I used this week is actually from Wisconsin, where the cheese is certainly not rotten, but some of the heads seem a little off (not that I’m taking sides or nothin’). It’s funny how many of our best foods have to do with rot. Besides blue cheese (almost all cheese really, if you count curdling), there are all sorts of food and drink that get their character from fermentation/fungus. Yeast leavens bread, turns juice into wine and malted barley into beer all by feeding on sugar and converting it into CO2 and alcohol. Then there’s the practice of aging beef, which still turns my stomach. I guess these foods made their way into our diets because they didn’t kill us. Unlike some of their more rotten counterparts. When some things go bad, they really go bad. Take potatoes, once they get start to go, they’re beyond redemption. Are they poisonous? Well, I’ll have to get back to you on that. Not to worry, though, the potatoes that make up the other key ingredient in this week’s soup are the not-even-close-to-poisonous kind. The trick is to use them before they rot. The result was my version of Potato cheese soup. Until now I had sampled potato cheese soups at various restaurants but I’d never made any myself. Most of the soups I’d tasted went with cheddar cheese or some sour cream variation for their cheesy goodness. I thought that a blue cheese would be a lot more interesting. The soup was a big hit at the family dinner table. Even the girls went back for seconds, which is the only true compliment. The soup actually made a second appearance the following night when I added peas and artichoke hearts and turned the whole thing into a sauce for some frozen ravioli we had on hand. It turns out the cheese isn’t so rotten after all. And the weather’s been pretty nice this week too. At least the cheese will last. Heat the oil over medium heat in a 2-3 quart soup pot, add the onion and sauté until slightly brown. Add the stock, potatoes and seasoning and bring the mixture to a boil before reducing it to a simmer for 20-30 minutes. Puree all the cooked chunks of potato using an immersion blender until the soup’s consistency is very smooth. Add the blue cheese and stir until the crumbled bits of cheese dissolve into the soup base. Serve warm and eat. You won’t be disappointed. You might even eat it the next night too. Image Credit: “Blue Veined Goodness” from the Public Domain. Now that I live adjacent to the nation’s #2 cheese producing state, I feel the urge to stick up for Californian cheese, but I think I can resist it. No point in cheesing anyone off. What are your aged dairy allegiances? Leave a comment. Your comment drew a burst of laughter out of me! This soup looks great. In fact, I’m off to the grocery store for the ingredients… It’s a “maker”. I really appreciate being able to go your site and find several things that I want to make for the week. Much easier that digging through multiple cookbooks. Love from all…(and TO all).